High Intensity Discharge (HID) lighting systems have been advertised to give you better visibility at night, use less energy, and they just look awesome. The first generation Focus offered HID’s between 2002 and 2004 as part of the limited-edition Mach ZTS and the SVT Focus. For those who are unlucky in not owning these exclusive vehicles, we have to only dream about HID’s…or do we? HID retrofit kits are now becoming more and more popular. More people are now buying these kits and putting them into their vehicles. But before you go out and buy a kit, slap it all together, and go on your way, you need to be aware of what is involved with an HID conversion. We Ain’t Talking HID Bulbs! Walk into any auto parts store or speed shop and you will see “xenon bulbs”. These are a gimmick. They may have xenon gas (which is what the bulbs contain used in a true HID system), or they may have other forms of inert gases that simulate xenon bulbs. Still, they operate like a normal halogen light bulb . Many of these “xenon bulbs” burn out quickly, and some no-name brands don't even meet North American safety standards. Yikes! There are also bulbs out there that produce a bluer light to make people think they can see far. In fact, they lose the amount of light produced compared to their stock halogen bulbs. So, by installing them you're driving with less visibility than before and becoming a danger to yourself and others on the roads. HID lighting is one way of improving vehicle illumination. Many companies, such as Philips and Osram/Sylvania claim the more intense, higher color temperature light results in three times the output of standard halogen lighting - almost to the point of being daylight. This means improved peripheral vision and enhanced down-the-road visibility, especially in bad weather. The end result is safer driving for everyone on the road. Because HID systems use a bulb that has no filmaent, it is theoretically possible the bulbs can last the life of the vehicle. Oh, and don’t forget they look great on any car. HID’s on any car tend to attract the attention of many on-lookers, as they are typically a feature on luxury vehicles. There have been increasing complaints to the National Highway Traffic Safety Administration (NHTSA) about the glare of HID’s, including those mounted in vehicles from the factory. You will get the few people in front of you who swear you are blinding them and creating a hazard for everyone on the road. NHTSA is currently looking into the effects of HID lighting, and is working with various manufacturers and organizations like SEMA to help come up with better solutions. Then there’s the hit on your wallet. Either as an option or as aftermarket kits, HID’s systems tend to cost above $500. Also, the replacement cost of bulbs and ballasts tend to also be expensive. OEM systems have been designed by the auto manufacturers to meet various regulations and levels of quality. This includes conforming to a country’s specific transportation laws, having the correct cut-off points to minimize glare for oncoming drivers, as well as making sure they withstand a downpour on a summer’s day. Ford designed OEM HID’s first for the European Focus and then for North American Foci. 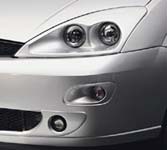 Ford Racing recently introduced a retrofit kit to allow owners to install the Mach HID’s into their 2000 to 2004 Foci. They come complete with the headlight housings, ballasts, bulbs, and even wiring for the task. They are, however, quite expensive. Some don’t like the entirely chrome housing. The Mach HID’s do not have a self-levelling feature, nor did Ford USA offer a washer element. People who converted their lights also found the packaging of the lights were inadequate causing broken mounting tabs and numerous trips back to the dealer. OEM HID’s used in Europe must come with a levelling feature to help reduce glare to oncoming motorists. They also require headlamp washers. Foci that come standard in Europe all have levelling features and headlamp washers. OEM HID’s used in the United States must be certified by the Department of Transportation (DOT). The stamping should be on the headlight housing or a permanent sticker. The Mach HID’s currently meet DOT standards. OEM HID’s used in Canada must also conform to Daytime Running Lights standards. For the Focus, the Ford Racing HID package is listed as being for “off-road use only”. Seeing how the lights are DOT approved, there’s a contradiction. People have only concluded this was a legal move to cover Ford from a lawsuit. Complete independent auxiliary systems are usually marketed by manufacturers of HID components, such as Hella or Osram/Sylvania. These systems usually work with the halogen low-beams currently in the car, and have been developed and tested to withstand customer’s expectations. These auxiliary systems often require little modification to the exterior of your vehicle. In the case of the Hella system, only the high beam is xenon and it's only available in Canada. These systems may cost more, but that cost is reflected in high quality parts and a safe system that meet government regulations. In many instances, obtaining replacement parts require you to have original proof of purchase. Pictured above: Sylvania Xenarc Kit for the Ford F-series pickup truck. Pictured above: Hella's Focus projector headlights with xenon high beam and halogen low beam. HID conversion kits are usually made up of parts from different manufacturers, and are marketed under various names. In many cases, these retrofit kits proudly advertise the use of name-brand components such as Hella, Osram or Philips. They usually come with relays and wires, the bulbs, and ballasts to ignite the xenon gas in the bulbs. Ideally, they are marketed so you will stand out from the crowd. 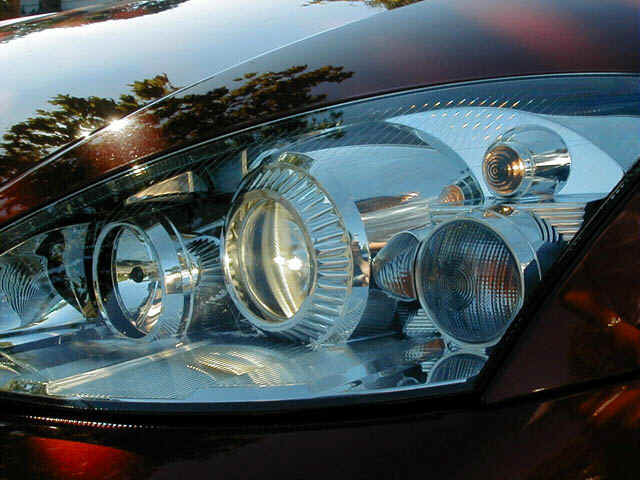 You also don’t have to alter the appearance of your car or truck because you’re using the same headlight housing. Oh, and there’s also the WOW factor. The biggest problem with many of these kits is the unwanted glare they produce! When automotive engineers design headlights, they do so assuming one type of bulb is being used. The reflective light housing is designed to properly aim the light. The light produced by an HID system bulb is very different than a halogen bulb. When you shove an HID system bulb into a headlight housing designed specifically for a halogen bulb, the light will bounce off the reflector and create a nasty light pattern and glare. Even though a lot of people who have done this conversion claim they see better at night, there has been little scientific research proving this is the case. Bottom line: The stock headlight housings weren’t meant for HID light units. The end result is not being able to see what’s in front of you clearly, as well as blinding the person in front of you or coming up on you. That’s all part of a recipe for disaster. Reputable HID conversion kit sellers make it explicitly clear these kits are only meant for show purposes and are not meant for use on public roads. This vehicle used an aftermarket HID kit and retrofitted it into a halogen light reflector housing. Note the lack of a proper cutooff in the beam pattern. You will see the glare that's produced in this set up. This is a proper reflector design. Note the sharp cutoffs in the light pattern. Aside from glare, some cheaper kits also don't withstand extreme weather that your vehicle is normally subjected. Some connections don't turn out to be waterproof, or maybe damp climates cause short circuits in a kit that you just spend a pretty penny..
Because the Focus uses one light bulb for both high beam and low beam operation, going to a conversion kit usually means you lose the high beam function. There are kits where there are two bulbs mounted to the same housing, or even tricked out so the bulb "moves" when you hit the high beams. Again, it's all gimmicks. If these were such great ideas, why haven't the auto manufacturers jumped aboard these ideas? HID retrofit kits are similar to conversion kits, but they go a step further. They often come with projector or reflector units that are already designed for HID use. All you need is to make them fit your existing headlights. These retrofit kits also proudly advertise the use of name-brand components (like Hella or Philips) or which vehicle the units came from (like Audi, Honda or Mercedes-Benz). Like conversion kits, one big problem with many of these kits is the unwanted glare they can produce. Although you have a projector or reflector unit that was already designed for HID’s, you’re now putting them into a housing that could theoretically bounce that light into different directions and create unwanted glare. It’s also unknown whether the manufacturers of these kits actually spend money in research and development to ensure they meet government regulations. The other issue is whether you have the patience to go through a retrofit. As with any modification, you have to know what you’re doing. If you mess up your current light housing with a retrofit, you’re almost stuck in having to buy a replacement. To date, no aftermarket HID conversion or retrofit kit has been approved by any government regulating body. All conversion and retrofit kits being sold have the explicit disclaimer “For Off-Road Use Only”. This means they aren’t intended for use on public roads and highways. There have been several cases where the US National Highway Traffic Safety Administration (NHTSA) has investigated and found these HID kits illegal because they produced excessive glare. NHTSA has forced these manufacturers to recall their items and stopped their sale. Some kits actually have various shielding on the bulbs or housings that claim to eliminate the glare. Since you’re only covering part of the light source, you’re not covering or controlling the rest of the light that’s bouncing off the stock light housing. So, glare might still be an issue here. Because some of these kits are bits and pieces from different manufacturers, they may not work well together and/or even catch on fire! There have also been instances where people have been ticketed for having illegal HID retrofit kits in their vehicles. Some law enforcement officers even make people rip the lights out on the spot. The question then becomes do you want all your time and money to go down the drain? You might be scared off from wanting HID’s now. There are other options such as installing projector headlights or using higher wattage bulbs. Each one of those also carries their advantages and disadvantages, including further complaints of increased glare. Be careful when using higher wattage bulbs, such as Sylvania Silverstars, PIAA or other "hyper-white" bulbs. Using higher watt bulbs may discolour headlamp lenses, and/or even melt connectors, housing, and related wiring. Also, some people have had their bulbs burn out faster than traditional halogen bulbs. So You Still Want HID’s? Ultimately, it’s up to you whether you want HID’s in your Focus or vehicle. The common consensus among car enthusiasts is that converting your car to have an HID lighting system is a lot more involved than just buying it and installing it. Do a lot of research into the system you want, and ask a lot of questions before swiping your debit or credit card. National Highway Traffic Safety Administration (NHTSA). October 19, 2004 Press Release 43-04, NHTSA Illegal Lighting Crackdown Continues.